I cried when I first saw them under the water. Do you know how hard it is to cry in a face mask and snorkel? I laughed at myself for crying! If I had surrendered to the fullness of emotions I was feeling in that moment, I would have sobbed uncontrollably. But I was with my dolphin family again after a long absence. I put those emotions aside so I could be fully present with them, here and now. I didn’t want to miss a thing. There were many swimmers and a few kayaks in the bay that day. The interactions among us all were fluid and harmonious. Humans and dolphins swam gracefully in each other’s energies. I was so very happy to be there! Many dolphins beckoned to me for closer interaction. Once I chose a dolphin to connect with, I’d follow that dolphin, or group of dolphins, as they led me away from the crowd. A group of four dolphins approached me most frequently. The first time they approached, they rose toward me from below. As they neared, I stopped swimming to give them space to surface in front of me, and then we swam together for a while, with me bringing up the rear. I held my breath in anticipation as they came near, consciously giving them space. They kept glancing back at me, assuring me that I was welcome among them. After their third identical approach in this fashion, the thought popped into my mind, Oh! I wanted them to come close to me, and here I am giving them space. I think they reminded me, telepathically, of my intention, so I could choose to interact with them differently. On their next approach, we made eye contact as they rose toward me from directly below. This time, I projected the thought that I was going to maintain my course and speed, so that they could choose where to surface in relation to me. I knew they knew exactly where I was. I watched as they rose, coming closer and closer, not veering away. I held my breath, still swimming, watching in fascination. Soon they were directly beneath me, almost touching me. The instant before contact, they spread out in all directions, and I was in their center. All four dolphins were inches from my body. There was a dolphin in front of me, one to either side, and I assume the fourth was behind me. My entire field of vision was filled with dolphin bodies, up close and real personal. I was amazed that we could be this close to one another and not touch! I so wanted to reach out and touch that skin, but I dared not breach the trust we’d developed. I willed my arms to remain glued by my sides. It was hard to do, but I managed. I had learned that my first instinct, my very first day in the water with these beautiful dolphins, was correct. It is inappropriate to reach out and touch dolphins in the wild. If physical contact is to be made, the dolphins should be the ones to initiate it. 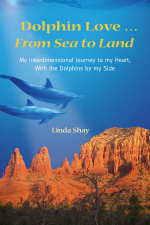 In this minipod we created, the dolphins’ eye contact was so direct; their intention was so clear. They knew exactly what they were doing. They were giving me precisely what I had asked for, with my heart. I felt our energies merge. We were one. I felt a fulfillment inside that was so complete, the thought passed through my mind, I could leave today, after this encounter, and be totally fulfilled.